Solitary Foraging in the Ancestral South American Ant, Pogonomyrmex vermiculatus. Is it Due to Constraints in the Production or Perception of Trail Pheromones? Several North American species of Pogonomyrmex harvester ants exhibit group foraging, whereas South American species are exclusively solitary foragers. The composition of the secretions of the poison and Dufour glands in the South American species, Pogonomyrmex vermiculatus, were analyzed, and the secretions and their components were tested as trail pheromones in laboratory bioassays. The major compounds in the poison gland were the alkylpyrazines, 2,5-dimethylpyrazine, 2,3,5-trimethylpyrazine, and 3-ethyl-2,5-dimethylpyrazine. The Dufour gland contained five alkanes, from tridecane to heptadecane, with pentadecane being most abundant. In behavioral bioassays, poison gland extracts and the mixture of pyrazines produced a trail pheromone effect, whereas the Dufour gland extracts and the alkanes had no effect on ant locomotion. We conclude that group foraging in P. vermiculatus does not arise from the inability to produce or detect possible pheromones, but rather, from physiological and/or ecological factors. 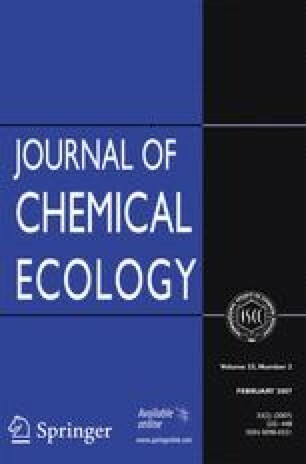 We thank E. D. Morgan for advice during the implementation of the solid sample injection technique and for sharing unpublished results on the analysis of pyrazines and J. G. Millar for suggestions during the editing of the original manuscript. We also thank Claudia Cabrillana for assistance in the laboratory. Financial support by FONDECYT (grant 3060064 to H.T.-C.) and International Program in the Chemical Sciences at Uppsala University (H.M.N.) is gratefully acknowledged.